As a man growing up in Louisiana, I have survived my share of storms. Being that I am a Christan man, most people would think that I am talking about personnel storms. Like divorce, raising children,being sick, death of a family member or lose of a job. These storms each of us share these everyday, but the storm stories that I am writing about are the ones that none of us have control of. These are the storms that have nothing to do with us or our sins . These are storms that are natural and controlled by God. It does not matter where you live, if you are blessed to live long enough , then you will have stories of your own experience going through Gods natural storms. For those of you who do not know or even understand what I am talking about, I will give you a few examples of what a natural storms means. If you happen to have a television or even if you do not, your government or weather station will warn you about them. (Hurricanes, tornadoes', floods, volcanic eruptions, fire storms, blizzards) These are just some of the storms we as humans may have to deal with and they come when we least expect it. What I have learned that going through a storm or storms can reveal what type of man or woman you are. It can also reveal both your strengths and weaknesses. It doesn't matter how prepared you are for them, because in a natural storm the unexpected always occurs. The storms I am about to write about is two hurricanes( Andrew and Katrina) that are forever etched in my memory. These storms tested my character, my will, my marriage and my will to survive. A lot of amazing things happen through both of them, but the most amazing thing of all was that I was able to survive them and learn to be a better man. What's funny about going through a storm, it does not matter how prepared you are when the arrive, when they happen you are helpless and at the mercy of the storm. All you can do if you are a religious man or woman is pray for Gods mercy. Now that I am done with the introduction its time for my story to begin. Hurricane Andrew 1992 , at that time I was 28 years old. Being an young adult I was still in the process of finding myself and wasn't very mature . I was already a father with two children. But at that time I only had brief visits with my children. As a young man I never really paid attention to the news or weather,my main purpose for life then was to work, buy clothes, party and spending time with my girlfriend. One morning for some strange reason I decided to watch the news, for me this was unusual ,because I never really paid attention to it. Just this past sentence along made me think of something my father used to say. He would say," Son you need to watch and pay attention to the news, instead of watching all those music videos and see what's happening in your world that you live in". After thinking about Andrew and what I went though one thought comes to mind, I survive my first storm as an adult. Well back to the story, on the news it said a tropical storm was in the gulf of Mexico and everyone from the gulf coast should prepare. At that time I just thought maybe they were guessing and didn't know where it would be headed , so I didn't prepare. So that day was just like any other day, I went to work, at that time I worked two jobs and I just basically free lanced my days. 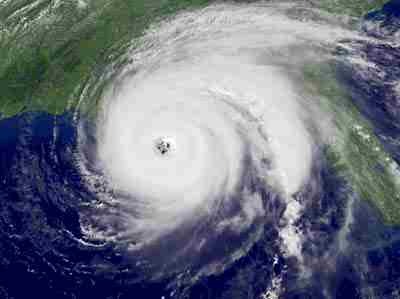 Before I knew it Hurricane Andrew was upon Louisiana. That is when I experience first hand the power of mother nature or better said the power of God. I saw wind tear roofs off of buildings, water in the streets that were as deep as rivers and I also got to see how spoiled we were as Americans. What I mean by this when your electricity , water and basic needs are taken away from you, then you find out what type of person you really are. I seen grocery store selves empty and people panic. The experience from that storm help me prepare for the storms of all storms Katrina. Now my true life story begins. I was newly married and making a transition from moving from one state to another. It was kind of ruff , because at the time I was working in Baton Rouge Louisiana and living in Liberty Mississippi(Which was a hour and a half drive one way). It was my first time living away from home or the first time I lived in a state or city with no none relatives. I had a old car that I had to keep water in it so it wouldn't over heat and I also had to get used to country living, which in itself was a hugh challenge. One day making my usual drive to work I heard on the radio that a tropical storm headed toward the gulf. Being that I experienced this before in my earlier life I was a little cautious. So when I arrived at work, I quickly went in too a room and looked at the news. From the forecast it said that the storm was headed toward Texas, but had a good chance of striking Louisiana. At that time I worked for a family owned business and they were very nice toward the employees. They told us if the storm got closer to the state, to stay at home and take care of each of our families. As suspected the storm indeed was head for Louisiana and it was a powerful storm. So from my past experience I tried to prepare for the coming storm. I told my wife at the time that we should store up as much water as we can and also to get plenty of ice. Being that she never experienced anything life a storm, she was a little resistant. I tried to reassure her that I knew what I was talking about, because I experience similar storms. But her lack of faith in me caused me to do all the work. So I went to the store, bought, flash lights, batteries, gas cans, can goods, candles and a generator so that we could have power. When I arrived at home with all of the items, my wife at the time said I was crazy and over prepared. I told her that even though I bought somethings to prepare our family for the storm, nothing could prepare us for what is yet to come. Boy was I right and in the next Chapters to come I will tell all my true life story.